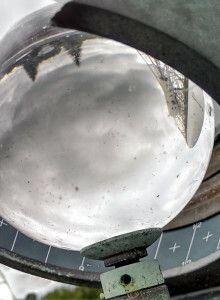 One of my favourite things at Jodrell Bank is the crystal ball on the roof of the Control Building. Don’t worry, I’ve not gone all Mystic Meg. It’s a Campbell-Stokes Recorder – a glass sphere which focuses the sunlight onto a card held behind it, burning a trace measuring the hours of sunshine. The sky in this close-up photo is cloudy, sadly a fairly common occurrence for the northwest of England, but the video below shows the recorder in the act of burning a hole in the equinoctial card. Luckily the Lovell Telescope, inverted and distorted by the glass sphere in the photo, works at radio wavelengths of around a few cm and so can see through the clouds.